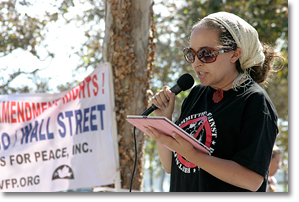 Cathy Mendonça speaking at the one-year anniversary of Occupy San Diego in an event co-sponsored with Veterans for Peace to mark the 11th anniversary of the beginning of the war in Afghanistan. Photo by Nic Paget-Clarke. My name is Cathy Mendonça representing the Committee Against Police Brutality (CAPB). This day marks 11 years of the U.S. military presence in Afghanistan. We were told as the bombs fell on this day that the Taliban government was in alliance and in full support of Osama Bin Laden. We were told that the US armed forces thus were in a long process of war and occupation to “free” Afghanistan from Bin Laden, the terrorist, and the Taliban government as open supporters of terrorism. According to writer Gore Vidal, Afghanistan was and is an area that with the right deal with the Taliban government there, pipelines for energy could be built that would make massive profits for energy companies. In July 2001, 2 months before 9/11, and 3 months before the Afghan war, a group of interested parties met in a Berlin hotel to listen to a former State Department official, Lee Coldren. According to Vidal, Coldren told the Berlin gathering that Bush was disgusted with the Taliban and was considering military action. Since that war began, it was discovered that under the Afghani soil there lies nearly $1 trillion in untapped mineral deposits: iron, copper, cobalt, gold and critical industrial metals like lithium. These deposits are so big and include so many minerals that are essential to modern industry that Afghanistan could eventually be transformed into one of the most important mining centers in the world. This 11-year action fits the definition of colonialism and neo-colonialism. A wealthy and powerful government guided by elites use force upon other nations and peoples for the enrichment of those elites. Words and phrases such as “war on terror”, “protecting our freedom”, and the older “civilizing the world” and “saving souls” are used to justify the distribution of a region's wealth from the indigenous of that area into the pockets of the already wealthy. This action, now 11 years old, is similar to what has occurred in Africa since the 15- and 1600s and into today when Europe’s powerful nations and their elites then would establish colonies of their own people while taking vast wealth in agriculture, minerals, and slaves. This wealth would either strengthen or create new empires in Europe and later the U.S. while depriving the Africans of their rights to develop their wealth and even lose the right to be free human beings as they became commodities to be sold off as well. The writer Frantz Fanon wrote that “The colonized are denied job security. Incomes are reduced to subsistence level. The poor are plunged into desperation. Mass movements, such as labor unions, are dismantled. The school system is degraded so only the elites have access to a superior education. Laws are written to legalize corporate plunder and abuse, as well as criminalize dissent. Massive job losses promote fear and instability. This ensures political passivity by diverting all personal energy toward survival.” Sure, neo-colonialism may be a new term with slicker rules but it is still an old, old game at our expense. So, what do the Colonial/Imperialist actions described in Afghanistan, Africa and upon the new economically colonized here in the U.S. have to do with a group that seeks to stop police brutality? Very simply, to assert its control over we who are frightened for our futures and our livelihoods and we who try to organize against this unjust system. The state and the elites can and will use the police to maintain this system to keep people in line and even in fear. Laws can and will be selectively enforced, bureaucracies will drag lawsuits against police abuse or give out light sentences and even dismiss charges thus frustrating and demoralizing and depleting the efforts of those who simply want the law to apply fairly. In the recent police shooting of Oscar Grant, a New Year’s Day reveler in full view of scores of people on a BART platform, the State dragged its feet, despite eyewitness and more than ample footage captured by camera-phone users. The officer was given manslaughter rather than a murder charge. In Arizona, Maricopa County sheriff, Joe Arpaio imposes the worst work camp conditions on detainees, while forcing them to wear pink underwear. The detainees are mostly Mexican immigrants who suffer from the worsening economic conditions brought about by the collapse of agriculture in Mexico due to Corporate flooding of cheap crops there. In Oakland, New York, Los Angeles and San Diego, the Occupy movement and its supporters from day one have been harassed, arrested, and beaten. They are deprived of the right to assemble. Why? The message is not popular with the elites. In contrast, the Tea Party rallies have had attendees show up armed with loaded handguns, but they were left alone. CAPB stands with those who are abused by police misconduct and the abused are we the people who are waking up to the fact that this war begun 11 years ago, as well as the Iraq war and others, are part of a colonialism that is in danger of being destroyed by its own excesses. We the people, We the 99% will only win a just world if we stay united against legal and economic abuse. The dismantling of an unjust system will take struggle and time. Working together, it can be done.